ATTENTION! 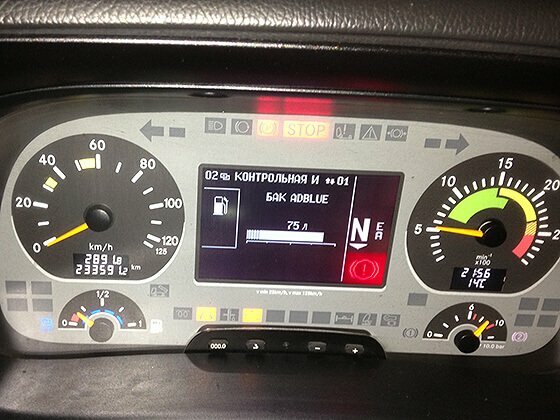 AdBlue Emulator V5 NOx works only on Mercedes-Benz trucks with BOSCH ECU. We recommend you to contact us directly before purchasing or installing emulator module on Mercedes-Benz vehicle if you’re not sure which ECU it has. AdBlue Emulator V5 NOx is compatible with several Mercedes-Benz trucks. Below is the installation manual of V5 AdBlue emulator for Mercedes-Benz vehicles. Before installing AdBlue Emulator V5 NOx on Mercedes-Benz truck, please make sure that you have emulator programmed to Mercedes-Benz program. You can order pre-programmed emulator, or you can change the program by yourself anytime you want. The first step is to switch off the ignition! Wait until all systems shut down completely. 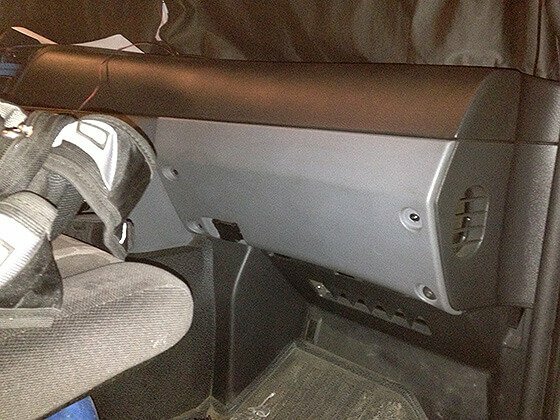 Locate panel on the right side (passenger side) of the cabin. Unmount the panel by removing four screws of the fuse panel (see photos). Remove the first fuse (F1) on the right side of the fuse panel. 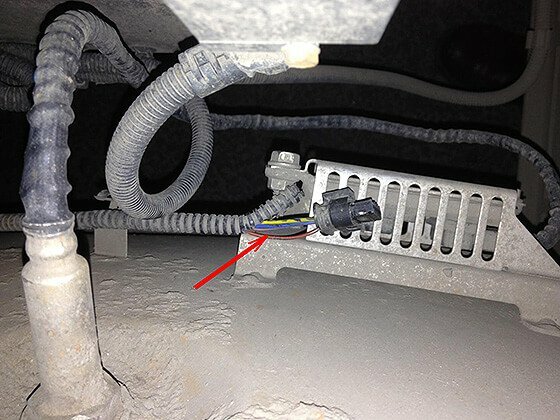 Now you need to connect AdBlue emulator wires to corresponding wires on the OBD connector. 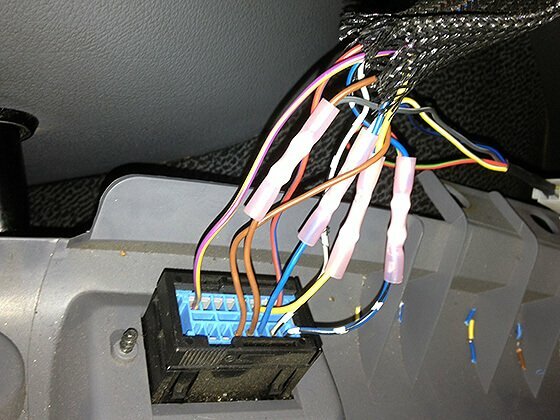 Connect the brown wire of OBD connector to the black wire of the emulator module (GROUND). It should be the first cable that you plug. Do not connect other emulator wires if the ground wire is not connected. It is necessary for safety reasons. 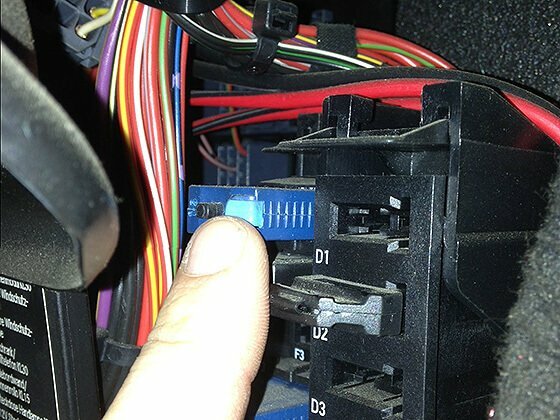 Connect the blue wire of the OBD connector to the white wire of the emulator (CAN HIGH). Connect the yellow wire (located in front of the blue wire) to the brown wire of the emulator (CAN LOW). And finally, you need to connect the blue-black wire with white points (15 terminal screw, is located on the right side) to the red wire of the emulator (POWER). 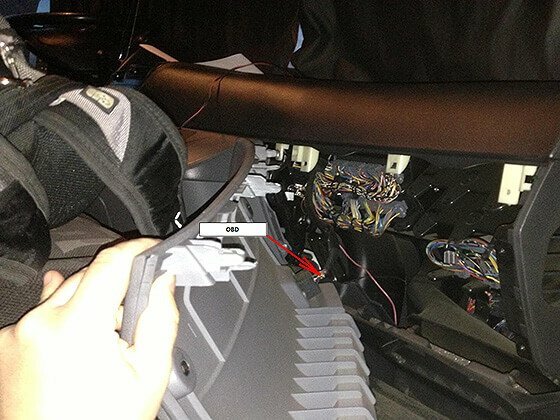 Now you need to cut off current of the NOX sensor (see photo). The sensor is easily accessible. Remove the chip, cut the corrugation, cut the red wire and insulate this cable. Now turn on the ignition. Check whether there is the level of AdBlue. If the AdBlue level appears, it means that installation made correctly. Fasten the emulator by the cable strap to not dangle. Carefully install all panels back. 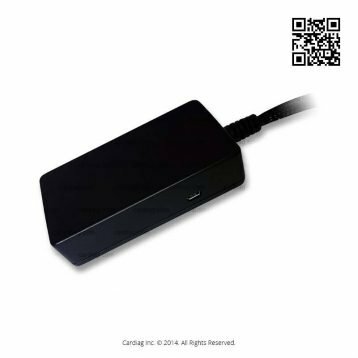 AdBlue Emulator V5 NOx installation manual for Mercedes-Benz trucks was last modified: May 26th, 2017 by Cardiag Inc.